MWCM - 2019 in focus - MW Capital Management Pte Ltd.
It’s that time of year where all the strategists and market commentators are out giving their views of where markets are heading into 2019. Most are still bullish. Earnings expectations are still relatively good (c.7.4% EPS growth expected for the S&P for 2019) and most strategists see the markets higher this year. Many are advocating being overweight risk assets, such as emerging market equities, on the expectations of a general improvement in sentiment. Given all that, it’s worth noting that most strategists got 2018 completely wrong and are usually terrible at timing market transitions. MWCM’s views are somewhat different. As was the case for 2018, we are not particularly optimistic and expect we are at, or very close to a turning point in the markets. With higher rates, continuing quantitative tightening and the massive roll over of corporate debt, we expect the next few years so see lower equity markets from current levels and a lot more volatility. Central banks may push the eventual ‘correction’ out, but we do expect to see some significant turbulence in the markets in the next year or two. You can push on a string for only so long. On the S&P, we expect the 50wma or 200dma to be tested for resistance. So, we expect another 5% move higher from current levels. 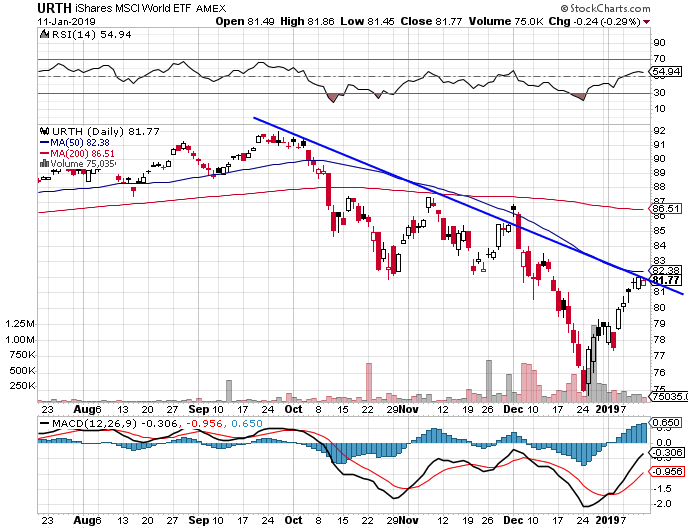 Similarly, we would expect the MSCI World to test its 50wma. 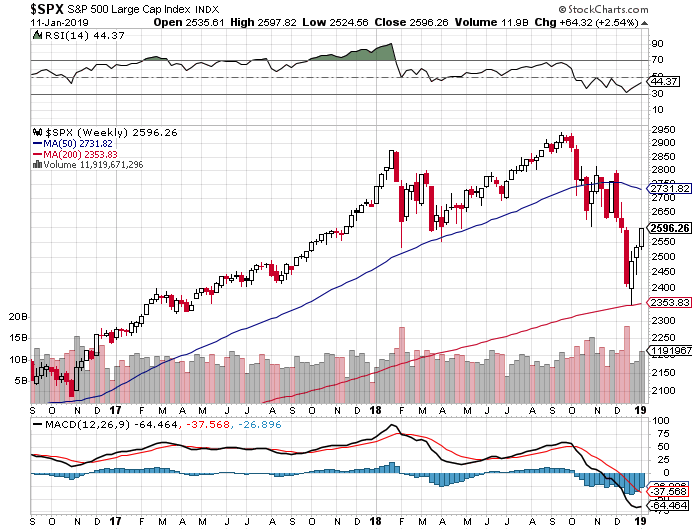 This is on the basis that the market is still very modestly oversold. Saying this, we have noted that some technical analysts are less optimistic and highlight that the markets are at or very close to the downwards trend line. The expectation of a further bounce in equities though, is also supported by data we see on borrowed stocks, which indicates that many CTA and other managers had increased their short exposure in December. A large part of the rally we have seen is short covering and we expect it has a little further to go. We have been adding equity exposure modestly in some client accounts, on the expectation of this bounce from recent market lows. While we use various technical indicators to determine if markets are oversold/bought short-term, we also use longer term indicators to give an indication of turning points. These technical indicators have also proven useful in confirming a bull or bear market. Based on some of the technical we use; we are still awaiting confirmation that we are in a bear market. 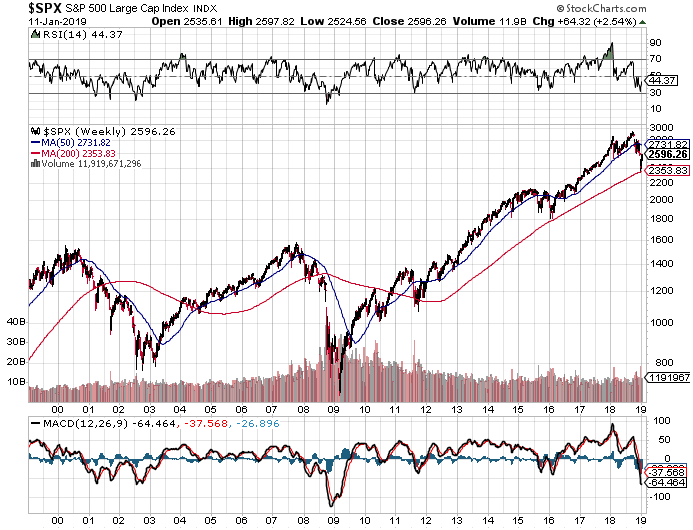 Should the S&P fall convincingly below the 200wma, this has historically been a good indicator of a longer-term bear. Looking at the monthly data is also reflective of how ‘overbought’ these markets were in early 2018, when we were highlighting the potential of a significant correction. The recent rally is due to high margins, lower taxes and share buybacks funded with a low cost of debt amongst other factors, but if we should see normalization of these factors, we should expect to valuations revert to the longer-term mean. While technicals are only one of the indicators we look at, they are useful when trying to assess support and resistance levels in the market during periods of transition. Core to our process though, is valuation. 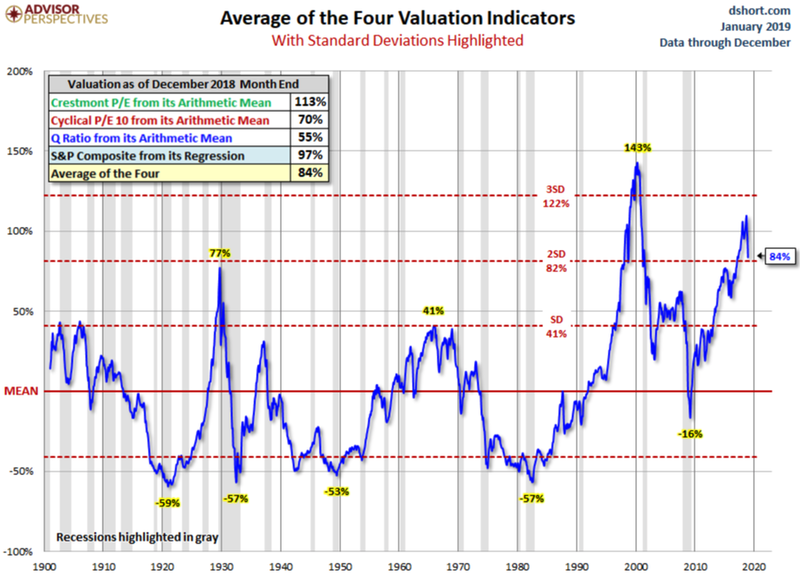 In this regards and relative to history, equities still do not reflect good value generally, in our view. This is more so the case, when considering a potentially slowing economy, higher rates, tighter liquidity, margin pressure and the significant roll over expected in corporate debt. Around USD 1.5tr will be refinanced in the next three years, in the USA alone. With the expected continuation of Quantitative Tightening, liquidity is going to continue tightening and higher interest rates are already hurting consumers and corporates. The Fed has done a lot already to calm the market, in terms of promising to be data dependant, but cycles have a nasty habit of occurring. 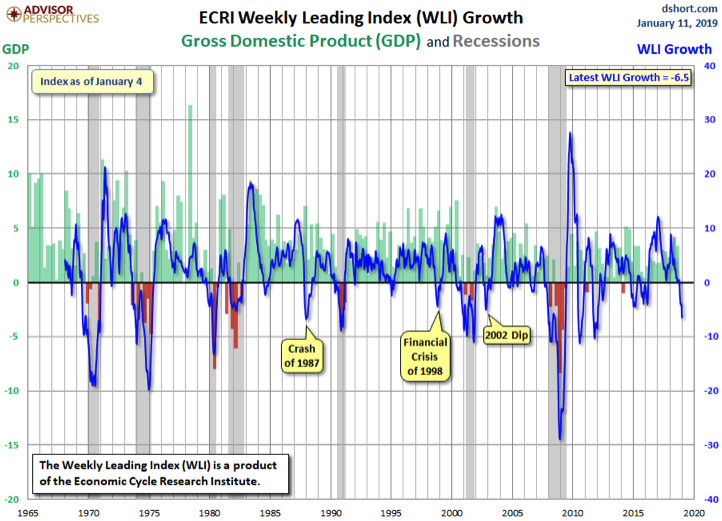 ECRI data would also tend to suggest we are at a turning point, though this data has offered a number of false flags in the past. Central banks may be able to extend the cycle, which they have indeed done already, but eventually their effectiveness is diminished and the ‘piper needs to be paid’. Furthermore, the longer they extend it for, the deeper or longer the eventual bust. The Fed, and Trump for the matter, has made it very clear that they will support the market and not raise as aggressively as markets had been expecting. This is certainly supportive to stocks on the short-term in 2019, but longer-term other factors, such as the impact of malinvestment, will come to bear. In a simple analogy, malinvestment is the uninvited guest to the economic party that usually drinks too much has too much fun and eventually causes the entire party to be shut down. The fact is, we are very long in the tooth in the current cycle. Strong consumer confidence and employment data, is more of a leading indicator of a turn in the cycle downward, rather than a continuation of current economic strength. The chart below is reflective of that with unemployment bottoming, just before a slowdown in the economy. In the chart below, the sections in grey are recessions. The usual flow is: the economy gets too hot, central banks tighten, their effectiveness is lagged and they overshoot, the yield curve gets inverted and the economy starts to weaken. This is usually followed by central banks then cutting rates, a steeper yield curve, an increase in volatility, weaker asset prices and an eventual bottoming of economic activity. The Fed, and likely other central banks, will provide support just as we saw in 2008, but not before markets are lower. Volatility is likely to pick up. While expecting markets overall to decline, traders could look to buy on weakness and sell on strength. A risky play in our opinion, but one that can add returns. Similarly, there will likely be greater dispersion of performance with companies with strong cash generation and balance sheets likely outperforming. We currently have a preference for high quality Technology names that have strong balance sheets and cash flow. Should our thesis prove correct, there will be a general flight to safety and we expect to see some of the Technology names benefit from this. Furthermore, many names we look at in the space have already come off close to 50%, so are looking fairly attractive as longer term holds. Europe and Emerging markets: We still see significant risks in Europe and parts of Emerging markets, which often get hammered during periods of market turmoil. Again, while higher risk areas may be strong short-term, we are not optimistic on a longer-term view and would be looking to exit/reduce on such strength. Our expectation is that, as our thesis starts to play out, the Fed and other central banks will reverse the current tightening cycle. Rates will fall and the yield curve will steepen. Mid to long duration bonds should do very well over a two-year outlook. We started advocating sovereign bonds in Q4 18 and this worked well for us. On the short term, however, given the impressive rally in the Sovereign bond space towards the end of 2018, we expect yields to go a little higher, before going lower. This is thus not the time to chase US sovereign debt. 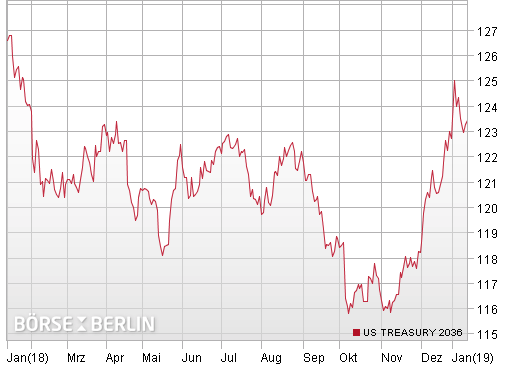 The chart below highlights the price of the 2036 4.5% US Sovereign bond. We prefer US sovereign paper, as it tends to be considered as a safe-haven play. While opinion can differ on this, we expect the asset class to be seen in this light should our thesis play out over the next few years. Beyond that though, we are certainly aware that there are major risks to holding US government paper, which is one of our reasons for advocating gold as a hedge. Given our overall view on the markets we would avoid floating rate debt as well as weaker investment grade credits. There is a massive amount of refinancing that must take place and we expect many investment grade credits to be downgraded to junk. It’s of note that gold performed exactly as it should have coming out of 2018. This is something we haven’t seen for a long while and it occurred as inflation expectations were declining. This may be counter intuitive to some who see gold only as an inflation hedge, which is a naïve view. Gold is much more than that. Gold is a hedge against uncertainty – a lack of confidence in the central bank, a weaker dollar, an increase in QE, deflation as well as inflation. 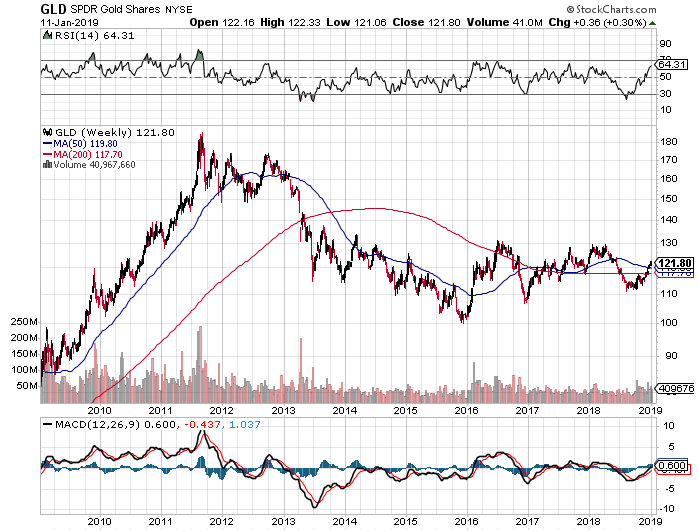 The chart below shows the GLD ETF share price, as representative of Gold. Should our thesis of a weaker economy and markets play out, we expect rates to fall and uncertainty to increase. Should the economy slowdown be severe, which is unlikely unless we see a severe loss in Fed credibility, deflation fears could reappear, which would be very positive for gold. More likely is we will have a period of mild economic weakness and the market will become fearful of easy monetary policies and higher inflation. The decade old play off between deflation and inflation will continue. We do though, expect to see a shift in the politic fabric, towards socialism and the policies of folks like Alexandria Ocasio–Cortez that everything should be ‘free’. She is the youngest person elected to congress and her rhetoric, while questionable, is loved by the economically disadvantaged populous. Free education, healthcare etc. all sound great but somebody has to pay for it and socialism has not had a great success record – see Venezuela, Zimbabwe and others. Our base expectation is that Gold will be bought through the economic down-cycle, on the expectation that the central banks and governments will implement policies that will be negative longer-term to the value of their fiat currencies. Both institutions favor inflation and we and other expect them to a) do their utmost to provide a put to the market and b) implement more inflationary policies to drive the real value of their debt lower. Given our central case that the global economy will be weaker, it’s hard to get bullish on commodities particularly those used in industry. We would, though, look at further weakness in the space as a potential buying opportunity as capex has been weak for a number of years and there may be supply pressures further out. Looking at commodities relative to their related equities, we would rather take exposure to the equities which look relatively cheap at this time, particularly in the Energy segment. We can find energy stocks trading at <5x EV/EBITDA which good yield and growth dynamics. We are looking at taking some exposure here. What holds us back from going aggressively into the space is the thought that prices may be lower further out. Every strategist seems to have a view on the dollar and there is some evidence, at least on the technicals, to indicate it will go lower. We see the dollar though, as a currency to hold should there be a flight to safety, and prefer it to other currencies particularly those in emerging markets and increasingly that of the GBP and EURO. Central to our view is that the USD will strengthen into the economic slowdown. We have seen this play out in most of the prior periods of market distress, with the other ‘flight to safety currency‘ being the Yen (as the carry trades are closed down). We would look to shift exposure out of the USD when the Fed capitulates as we expect, to lower rates aggressively and provide Quantitative Easing. We are a long way away from that yet. We hold Gold as a hedge against an ultimately weaker dollar. The sell-off in Q418 provided a terrific reminder of how important it is to be prepared for periods of sudden increased volatility and a rush to the exits. Many participants were caught with their proverbial pants down, not knowing what to do. 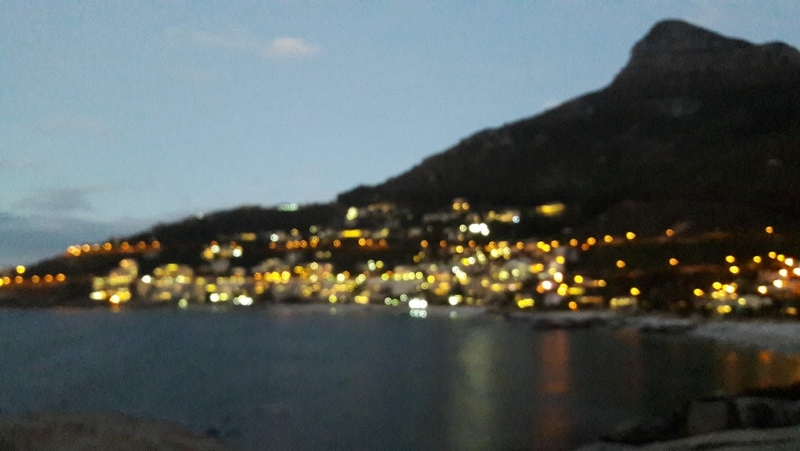 We expect 2019/20 to be more of the same – periods of exuberance followed by severe sell-offs. A little like we saw in 2008 but less severe overall, as the Fed and others will step in and act as a market put in the only way they can. Printing and providing liquidity. Holding some Gold is still core to the portfolio. Equities will likely be volatile and dispersion of performance amplified, so being selective here is critical. We will sell down on strength and add as opportunities arise. We will only buy into companies that we would feel comfortable holding through the cycle. In terms of bonds, we will be minimizing exposure to corporate credit, preferring rather high quality US sovereign debt. We will also be looking to reduce our exposure to alternatives, particularly those that we feel don’t share our market view and allocations. This material is mean for accredited clients only. Nothing in this document should be perceived in any way as a recommendation or solicitation to buy or sell any security or fund. The securities and accounts highlighted have been selected to illustrate MW Capital Management Pte Ltd investment approach and are not intended to indicate how any MW Capital Management Pte Ltd fund or account has performed or will perform in the future. The securities and accounts discussed herein in do not represent any entire portfolio or account managed or advised by MW Capital Management Pte Ltd and may not be suitable for all or any readers. Any views, forward looking statements, projections and current investments are based on assumptions and judgements. Because of the significant uncertainty inherent in any assumption and judgements we make, you should place no reliance on such forward-looking statements or views – they may not prove to be accurate and actual results may differ materially. Furthermore, they will change over time and should not be relied on in any way. There is no obligation for MW Capital Management Pte Ltd, and the company expressly disclaims any obligation, to update or alter the statements, predictions or any other information contained herein. This material is intended to be of general interest only and should not be construed as individual investment advice or a recommendation or solicitation to adopt any investment strategy. The views expressed may change without notice. Certain economic and market information contained herein has been obtained from published sources prepared by others. MW Capital Management Pte Ltd assumes no responsibility for the accuracy of such information. All investments involve risk, including the potential loss of principal. Performance data is estimated and has not been audited. Funds performance data is usually delayed by a few weeks after month end. It should not be relied on or imply future performance.